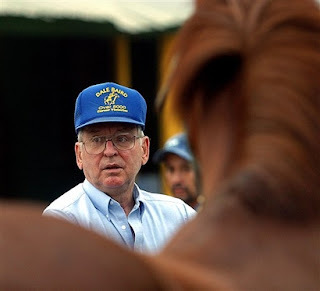 West Virginia-based trainer Dale Baird, the winningest thoroughbred trainer with more than 9,400 victories, died in a crash along an icy highway when he lost control of his pickup truck while hauling a livestock trailer Sunday, Dec. 23, 2007 in Eastern Indiana. Edward P. Evans’ Nite Light stalked the pace, took over at the half-mile pole and easily extended his lead in the stretch, taking the $75,000 Gallant Fox Handicap by 10 comfortable lengths, and in the process denied Successful Affair’s bid to repeat in the 1 5/8-mile route on Dec. 29 at Aqueduct. Virginia entrepreneur, Halsey Minor has purchased Carter’s Grove Plantation — an 18th-century mansion built by one of Virginia’s founding families — for $15.3 million from the Colonial Williamsburg Foundation. 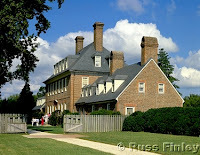 The property includes a Georgian-style mansion and 400 acres that are subject to a conservation easement, as well as 76 acres adjoining the property. 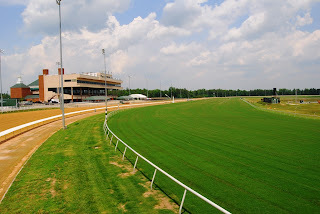 Seeking overall growth in horse racing, the Virginia Racing Commission Dec. 19 extended Colonial Downs’ request for 40 days of live Thoroughbred racing to 45 for 2008. While the number of days was set, factors could affect the specific dates for racing. In the commission’s approval is a window to race five days a week over nine weeks during the 10-week period between June 6 and Aug. 12. 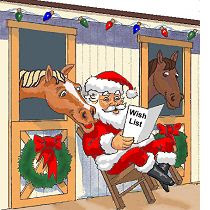 From everyone at the Virginia Thoroughbred Association and the Virginia H.B.P.A., the warmest wishes for this holiday season! Eve Prime Fout of the Plains, a giant in open space land protection and horse sports in Virginia, died Wednesday, Dec. 5, at the University of Virginia Hospital after a brief illness. She was 78. 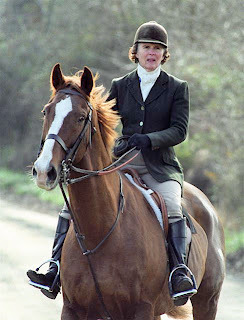 The mother of three and widow of the late horseman Paul Fout. IS MAGNA SUICIDAL OR JUST PLAIN DUMB? 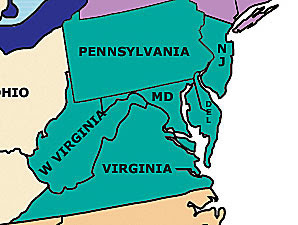 Every time I get a little bit exasperated with racing and breeding here in good old Virginia, I simply glance north to Maryland. Last week’s news of the firing of popular track executive Lou Raffetto made we wonder if, in fact, Magna is suicidal and Maryland is simply doomed? 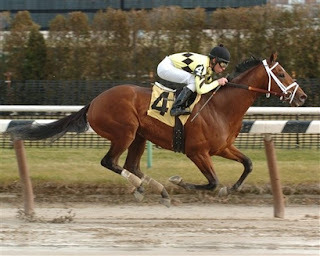 As expected, states in the Mid-Atlantic region have announced they are working to implement a ban on anabolic steroids in racehorses effective April 1, 2008. 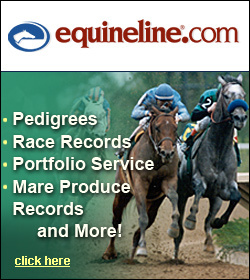 The regulations in Delaware, Maryland, New Jersey, Pennsylvania, Virginia, and West Virginia will employ the model rule devised by the Racing Medication and Testing Consortium and endorsed by the Association of Racing Commissioners International. LEGENDS. 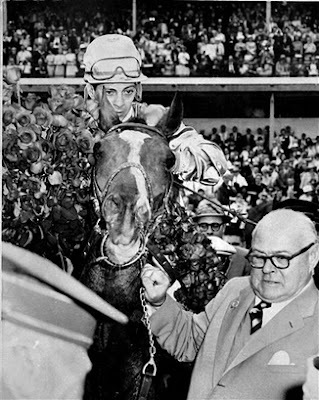 Bill Hartack on board legendary sire Northern Dancer in the winner’s circle following the Kentucky Derby with owner/breeder E.P. Taylor. 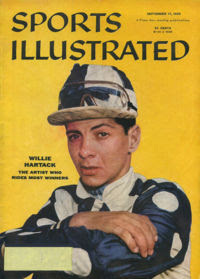 Bill Hartack, a mid-century sports icon during his heyday as a jockey, and one of only two five-time Kentucky Derby winners, died Monday at 74. 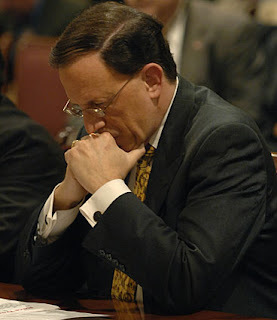 Hartack died of natural causes due to heart disease, according to Dr. Corinne Stern of the Webb County medical examiner’s office in Laredo, Texas. Stern said she had pronounced Hartack dead at about 9:30 Monday evening. Funeral arrangements are pending.